First Public Viewing of PBS American Masters Documentary About Charley Pride To Premiere At Franklin Theatre, Friday, February 8 With Extended “Director’s Cut” | 2911 Enterprises, Inc.
NASHVILLE, Tenn. – Residents of the Greater Nashville area will be among the first to have an opportunity to view an extended Director’s Cut of the all-new PBS documentary – before its’ network premiere on Feb. 22 – about the life and career of legendary Country music superstar, Charley Pride. 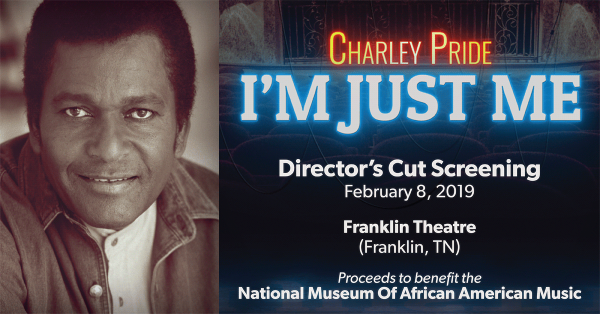 American Masters – Charley Pride: I’m Just Me will make its first public showing on Friday, February 8 at 7 p.m. CT at Franklin Theatre. Immediately following the film will be a hosted Q&A with the film’s director, Barbara Hall, those featured in the film; Lloyd Green and Craig Havighurst, and Dr. Bennett from the National Museum of African American Music (NMAAM). Proceeds from the event will benefit the National Museum of African American Music. For more information, and to buy tickets, click here. • Charley Pride and his wife Rozene speak candidly about Pride’s struggles with mental illness over the years. While on tour in Germany in 1968, the singer suffered a manic attack and was diagnosed with bipolar disorder. • Charley Pride and fellow country music superstar Willie Nelson reminisce on camera about the early days of their careers. • Charley Pride explains how he maneuvered his way through the white ranks of country music in order to gain acceptance in the industry. Launched in 1986 on PBS, American Masters has earned 28 Emmy Awards — including ten for Outstanding Non-Fiction Series and five for Outstanding Non-Fiction Special — 13 Peabodys, an Oscar, three Grammys, two Producers Guild Awards, and many other honors. To further explore the lives and works of masters past and present, American Masters offers streaming video of select films, outtakes, filmmaker interviews, the American Masters Podcast, educational resources and more. The series is a production of THIRTEEN PRODUCTIONS LLC for WNET and also seen on the WORLD channel. American Masters – Charley Pride: I’m Just Me is a production of Corridor Group Productions Inc in association with THIRTEEN’s American Masters and ITVS. The film is directed by Barbara Hall, who is also executive producer. Co-executive producers are Greg Hall, Suzanne Kessler and Ed Lanquist. Jon Schouten is producer. Editors are Matthew Walsh and Chris Windings. Writer is John Schouten. Michael Kantor is American Masters series executive producer. Support for American Masters – Charley Pride: I’m Just Me is provided by Mike and Ginny Lester. Major support for American Masters is provided by AARP. Additional support is provided by the Corporation for Public Broadcasting, Rosalind P. Walter, Ellen and James Marcus, The Philip and Janice Levin Foundation, Judith and Burton Resnick, Lillian Goldman Programming Endowment, Vital Projects Fund, Cheryl and Philip Milstein Family, The Blanche & Irving Laurie Foundation, The André and Elizabeth Kertész Foundation, Michael & Helen Schaffer Foundation, Seton Melvin, and public television viewers. Be sure to follow Charley Pride on Facebook and at CharleyPride.com. Charley Pride is celebrating more than 50 years as a recording artist. He has enjoyed one of the most successful careers in the history of country music and is credited with helping to break color barriers by becoming the first black superstar within the genre. A true living legend, he has sold tens of millions of records worldwide with his large repertoire of hits. A three-time GRAMMY® award and Recording Academy “Lifetime Achievement Award” winner, Pride has garnered no less than 36 chart-topping country hits, including “Kiss An Angel Good Morning,” a massive #1 crossover hit that sold over a million singles and helped Pride land the Country Music Association’s “Entertainer of the Year” award in 1971 and the “Top Male Vocalist” awards of 1971 and 1972. A proud member of the Grand Ole Opry, Pride continues to perform concerts worldwide and has toured the United States, Canada, Ireland, The United Kingdom, Australia and New Zealand over the last several years. His latest album, Music In My Heart, was released in 2017 on Music City Records. For more information, visit CharleyPride.com. Launched in 1986 on PBS, American Masters has earned 28 Emmy Awards — including ten for Outstanding Non-Fiction Series and five for Outstanding Non-Fiction Special — 13 Peabodys, an Oscar, three Grammys, two Producers Guild Awards, and many other honors. To further explore the lives and works of masters past and present, American Masters offers streaming video of select films, outtakes, filmmaker interviews, the American Masters Podcast, educational resources and more. The series is a production of THIRTEEN PRODUCTIONS LLC for WNET and is also seen on the WORLD channel. The National Museum of African American Music, set to open in late 2019, will be the only museum dedicated solely to preserving African American music traditions and celebrating the influence African Americans have had on music. Based in Nashville, Tenn., the museum will share the story of the American soundtrack by integrating history and interactive technology to bring musical heroes of the past into the present. For more information, please visit www.nmaam.org.